GlenAllachie distillery is an independent, Scottish owned and managed whisky company. 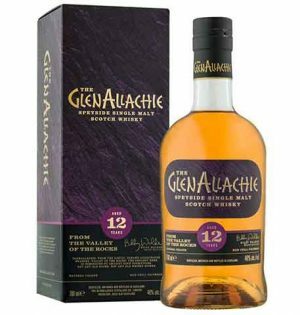 GlenAllachie 12 year old, the heart of their range, is a landmark bottling. This is the first time the whiskies have been officially distillery released, their best casks selected and bottled under the careful eye of Master Distiller Billy Walker. Matured in a mixture of virgin oak, Oloroso sherry and Pedro Ximenez sherry casks. Natural colour, non-chill filtered. 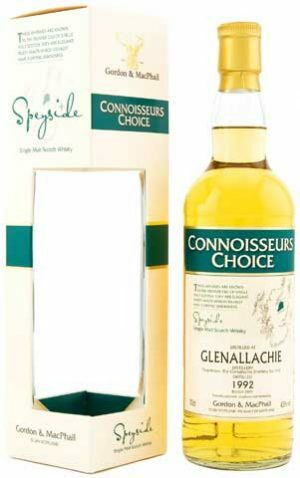 "honey, marzipan and bananas, with lashings of butterscotch, raisins and a delicate hint of mocha"
A Gordon & MacPhail, Connoisseurs Choice bottling of this little seen Glenallachie, one of Pernod Ricard's Speyside workhorses. This is from the 1992 vintage and is a mix of refill bourbon and sherry casks.